Hydroplaning (also known as "aquaplaning") is a common occurrence when the roads are slick due to heavy rain or snow although there are many factors that could lead to a hydroplaning accident. Hydroplaning occurs when a car tire moves over a slick road surface but fails to hold traction. When too much water gets into the tire tread the water cannot be pushed away quickly enough causing the vehicle to skid of a thin layer of water sitting between the road surface and your tires. 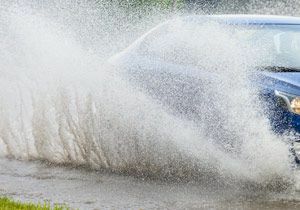 The first few minutes of a rain shower of thunderstorm is especially dangerous as the water mixes with oil on the road’s surface causing slippery conditions. Have you been hit by a driver that lost control of their vehicle due to hydroplaning? Did you know that you may be eligible to file a damages lawsuit that claims financial compensation for any physical or property damage that you may have sustained in the crash? If you or a loved one has been injured in a hydroplaning accident caused by a careless driver, the victim may be entitled to compensation for property damage, medical bills, lost wages, and more. For a free review of your accident claim, fill out the ‘FREE CASE REVIEW’ form located to your right or call us today at (855) 522-5291. We offer hydroplaning accident victims complimentary consultations and we only get paid when we win. It may seem that a hydroplaning collision can occur simply due to Mother Nature, but there are other factors that can contribute to this dangerous situation. Speed: If a motorist is driving at high speeds they are more likely to lose control of their vehicle during slick road conditions, especially during turns. Water Drainage: Poor water drainage may lead to large puddles of water, oftentimes it is difficult for a driver to decipher just how deep the puddle is. Tires: Tire tread is what assists in keeping a car grounded, poor tire tread can quickly lead to hydroplaning as can poor tire pressure. A motorist can prevent a hydroplaning accident by slowing down during rainy conditions, watching for puddles, and keeping up with proper vehicle maintenance. Another way a person can prevent a hydroplaning accident from occurring is to learn how to handle the situation should it ever happen to them. Drivers should consider taking the following steps to try to regain control of their vehicle. As losing control of a car can be a scary situation, it may be best for the driver to pull off to the shoulder or a nearby parking lot to regain their composure and check for any vehicle damage. If a vehicle hydroplanes, a driver or passenger may sustain injuries if they crash into another vehicle or fixed objects. Depending on how serious the collisions a person could suffer from serious personal injuries if the vehicle rolls over onto its side or crashes head-on with another car. Being involved in any type of collisions can be devastating, especially when it was caused by a reckless driver. If you or a loved one has been hurt in a hydroplaning accident due to no fault of your own, the victim may be entitled to compensation. To find out more about your legal rights and how we may be able to help you with your car accident claim, contact us at 1-855-522-5291. Our intake staff members will connect you with one of our lawyers best suited in handling your claim. You may also contact us online by filling out the ‘FREE CASE REVIEW’ form located at the top right hand corner of this page.